Spirit Soundcraft Absolute 2If you are looking around for a very affordable speaker with lots of power and good sound quality then Soundcraft has built a product for you. Spirit Absolute 2 is the only loudspeaker for its price range to deliver 100W power. Spirit Absolute 2 does nicely offering an uncolored, flat frequency response and low distortion at high volume. The price is a clear winner here and makes up a lot for a lack of all round low frequency coverage that only speakers in the Â£800 plus range can deliver. 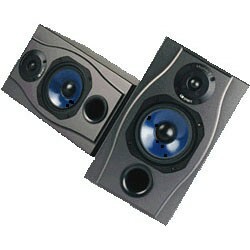 The vented cabinet design with the 6.5"/165mm low-frequency driver gives a balanced bass response. The soft-dome tweeter and crossover try to keep free from any unnatural colouration. Another useful feature is magnetic compensation allowing Absolute 2 safe use next to video and computer screens as well as the ferro-fluid cooled soft-dome tweeter that puts less strain on your ears after long periods of high-volume monitoring. You want to keep the speakers in the upright position for best performance and bass response is best when the cabinets are close to a back wall. The company suggests amplifier power ratings of up to 100 Watts RMS, though more powerful amplifiers can be used with caution. Bi-wiring of the HF and LF connections can be made by removing the shorting links supplied and using two sets of cables from the amplifier.